Aunt Tana had this fun wagon down in her zoo, and as soon as Desert Boy saw it, he scampered up on it and started playing with the handle. If it has wheels, he wants to be on it! He started making his vroom, vroom noises as he imagined he was riding along. The goats bleated in the background, making for quite an interesting cacophony of sounds. Even though Desert Boy didn't move the wagon anywhere, he was happy. He's generally a very happy little boy. 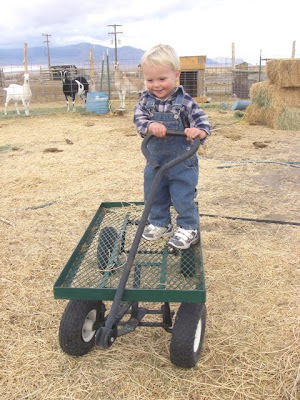 Later we decided to play another game--Desert Boy would pull his Mama sitting on the wagon. 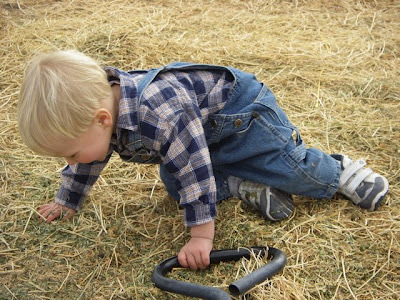 He grabbed hold of the wagon handle and pulled with all his might. 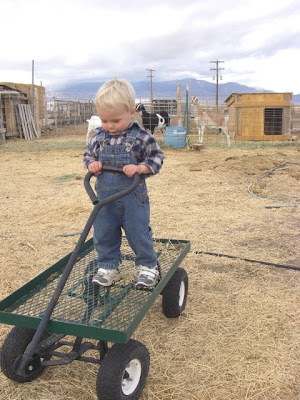 There was a little too much friction to get the wagon going, so I gave a little push with my legs. And that made him promptly fall down. He thought it was funny. He got up and tried again. And quickly fell down again when I gave the wagon a little nudge. This went on and on, with Desert Boy pulling and falling, pulling and falling, and he thought it was the best game ever. Fortunately I managed to catch some of it in video mode so you can hear his laughter. Have a great day! Yesterday my husband and I dehydrated some apples. Yum! Why, you might ask, do you need to dehydrate food if you live in the desert? Why can't you just put the apples out in the sun and let them dry out by themselves? If you have three to four continuous sunny days in a row over 100 degrees Fahrenheit, it will work. Out here in November, it's freezing at night and our days are getting into the 50s, so we have to figure out something else to do. 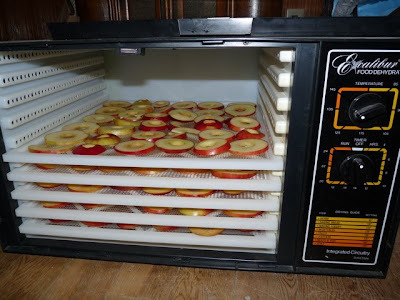 An oven can work to dry fruit, but isn't very efficient, so we dug out the old electric dehydrator. 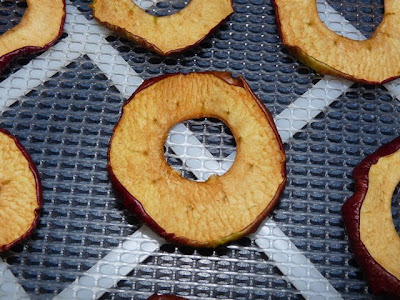 The first step to dehydrating is preparing the fruit. 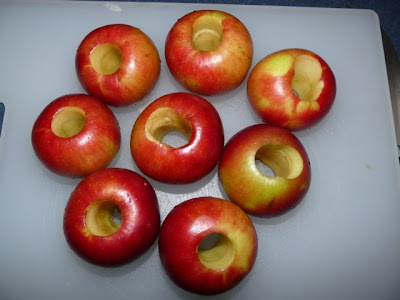 I cored these tasty Winesap apples. As you might notice, some of my holes aren't exact circles--my aim was a little bad! 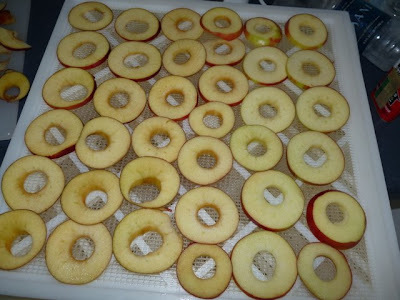 Then you slice the apples and put them on a dehydrator sheet. Note the size of the apples and how they cover the entire sheet. 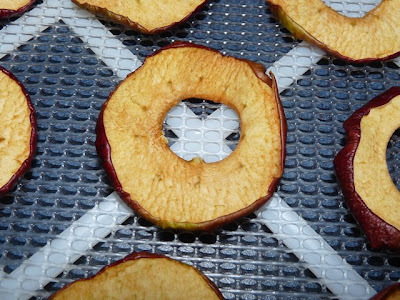 Then it's time to put the apples in the dehydrator. We set it for 145 degrees for about 16 hours. Dehydrating is a long process. 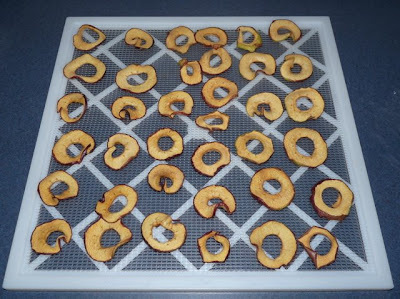 Here's what the apples look like when they come out of the dehydrator. They are definitely a lot smaller once they've lost their water. But the taste is more concentrated, and they are better than candy. That's saying a lot coming from a dedicated sugaraholic. We were all greedily snacking on them as we put them in bags. Yum! 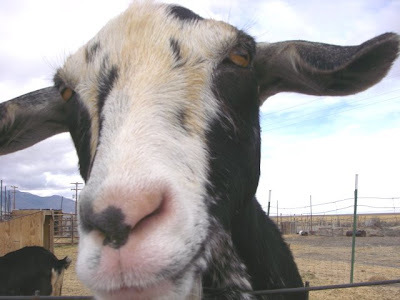 This is one of the Nubian goats. Tana knows much more about them, but she was busy playing football so Desert Boy and I just visited for fun. 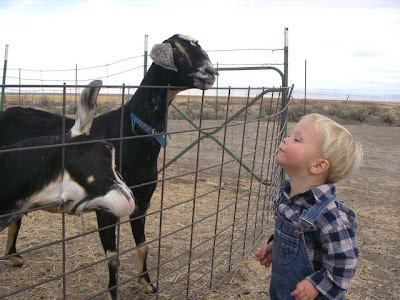 In a future post I'll tell you all sorts of interesting details about these goofy goats. The goats had lots of fun making noise. Desert Boy had lots of fun making noise too. 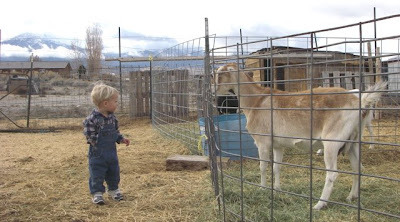 The goats were very interested in the little person hanging out with them. It didn't take Desert Boy long to get up close. 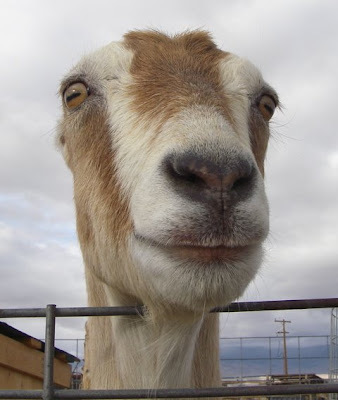 I love the eyes of this goat. If it looks a little strange, it's because it doesn't have any ears. 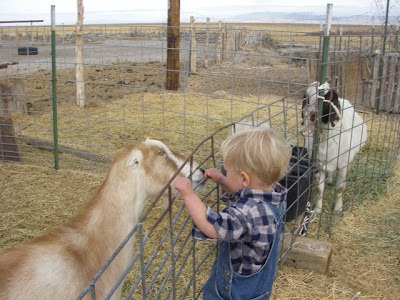 Desert Boy got a little braver and started petting the goat. 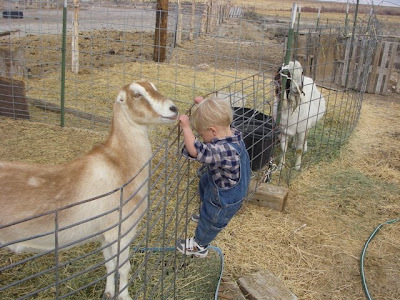 The goat was quite happy for the attention. 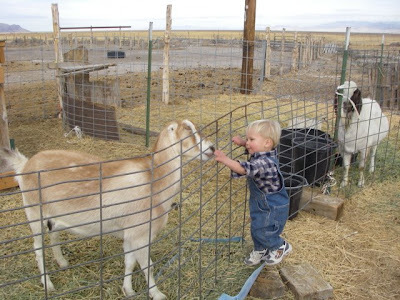 Then Desert Boy started climbing the fence to get into the goat pen. 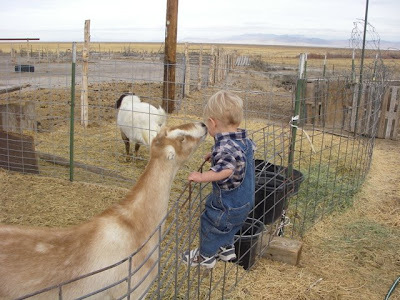 Note the goat in the background carefully observing the action. Almost to the top! But Desert Boy didn't go in. He hasn't figured climbing over fences yet, just climbing up. 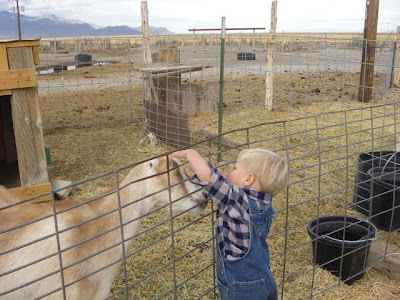 The sounds of the goats and Desert Boy were fun, so here's a short video for your enjoyment. Happy Thanksgiving! Traditionally we associate turkeys with Thanksgiving. Thanks for checking out this blog for a slightly different take on turkeys. 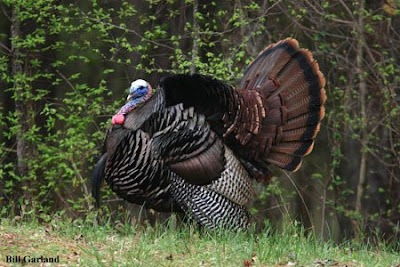 Around here, the state introduced wild turkeys (Meleagris gallopavo) a few years back. Although wild turkeys are native to large parts of North America, they aren't native to this area. Nevertheless, the state thought it might be fun to put some in so people could go hunt them. (We'll just ignore any effects they might have on the native wildlife before I go off on a long diatribe.) The wild turkeys have flourished and now are in all sorts of places they weren't supposed to go. Although this time of year would seem to be ideal to have the hunt, the season is March -May. 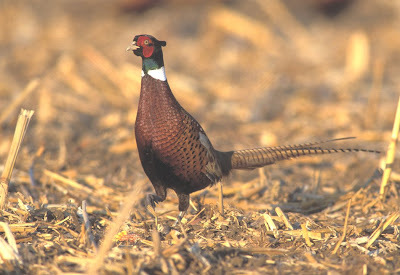 Another introduced game bird is the ring-necked pheasant (Phasianus colchicus). Some people near here tried to raise these in pens so they could then be released for hunters to shoot, but foxes kept getting into the pens and killed them all. 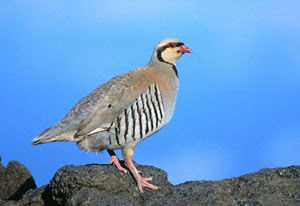 This bird, originally from Asia, is one of the most sought-after game birds throughout the U.S. In Nevada, hunting season is all the month of November, so it could be a good potential replacement for the standard turkey dinner. I figure if a bird has to be introduced, it should be something really exotic with a silly name, like this Himalayan Snowcock (Tetraogallus himalayensis). The only place it lives in the U.S. is in the Ruby Mountains in northeastern Nevada. 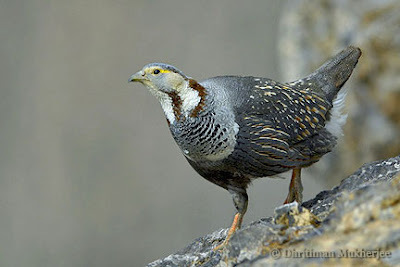 As such, it has become a mecca for birders who want to add it to their life list without traveling to the Himalaya Mountains. Bird trips like this one are organized to go see the Himalayan snowcock. Some birders will even go so far as to hire a helicopter to get them up to the high elevations where the bird prefers to live. There's a hunting season for the snowcock, from September to November. It makes me wonder who provides more to the local economy: hunters or birders in search of this elusive bird? 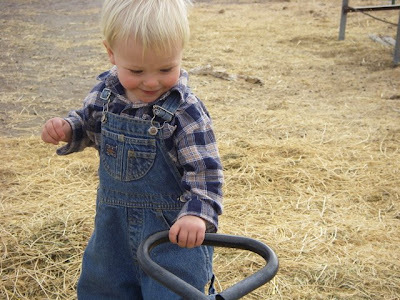 I have cows on the mind, maybe because we drove through the feed lot today, and then Henry started chasing the cows. Or maybe because I can't believe all the cow-related products that are on the market. Or maybe because Desert Boy says "mmmmm" (his version of Mooo) all the time. Anyway, this cow pretty much sums up how I feel right now. Mooo. Here's a chance to see how good your cow knowledge is. What kind of calves are these? 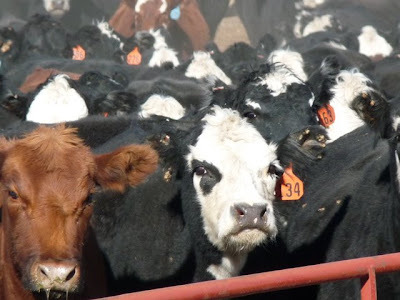 If you need a refresher about different kinds of cows, click here. Then take a good look at the coloring of these calves. 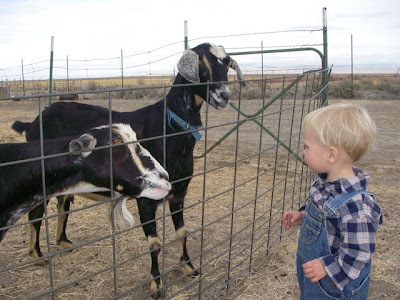 Okay, if the refresher didn't help much, that's because we don't have this type of cow on the ranch. I guess I'm like one of those mean teachers, trying to get you with a trick question. Don't worry, I do have the answer, it's below the next picture. I just don't want to reveal it too fast, and if you have a big computer screen you'll be able to see the answer before you even have time to think about it. I'm all about suspense. 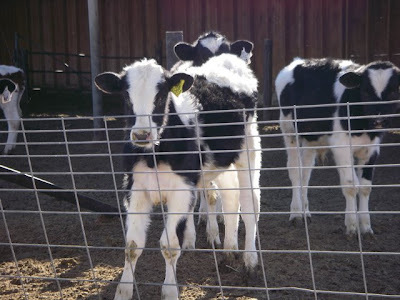 Answer: These are Holstein calves, and they live at a nearby dairy. Some fun cow facts: Holsteins make up over 95% of the dairy cattle in the U.S. A good milk cow produces about 25 gallons of milk a day, the equivalent of about 400 glasses of milk. 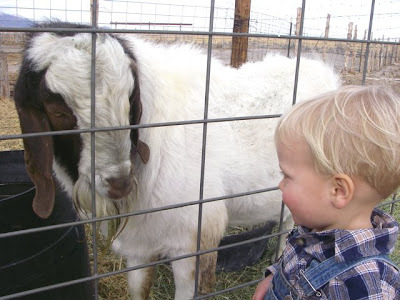 In order to be able to produce the milk, the cow has to have a calf, which weighs about 80-110 pounds at birth. 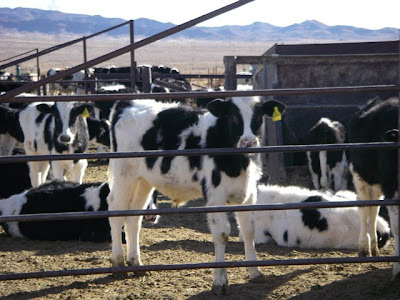 The calf is weaned at 8-9 weeks and then the cow's milk is used for production. 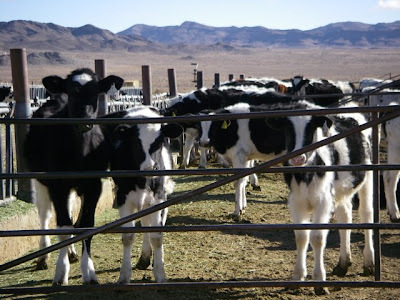 In the U.S., there are about 110,000 dairy farms with 9.2 million dairy cows. More than 99% are family owned and operated. Until the 1850s, nearly every family had its own cow and went out and milked it each day. Today we can thank these dairies for providing the milk we drink. To learn how dairies work, you can visit the Fair Oaks Dairy in Indiana, where they even have a virtual tour. The local dairy is much, much smaller, but it still works on the same principal: the cows are milked several times a day, and the milk is sent to a bigger processing plant. As a family that drinks several gallons of milk each week, we sure are grateful to have these cows around! 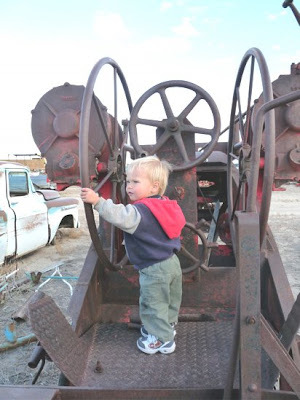 A few weeks ago we visited the equipment yard located on our ranch, and we just barely scratched the surface of all the interesting things that are there. In addition to being a depository of ranch history, the equipment yard has also been an inspiration for my NaNoWriMo novel, which I'm about 70 percent done with and will finish up by November 30. I don't want to give away my plot, but suffice it to say that the cars' stories will be heard. 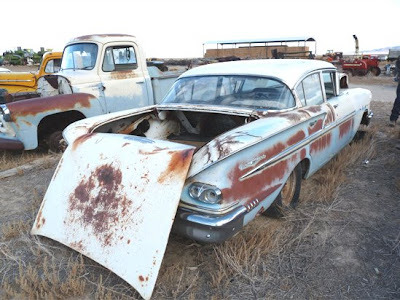 Above is a 1957 Chevy Belair, Uncle Larry's car. Uncle Larry used it to go to California and back. Once he retired he mostly fished and played bridge when he wasn't irrigating. He died two weeks short of his hundredth birthday and missed the big party. 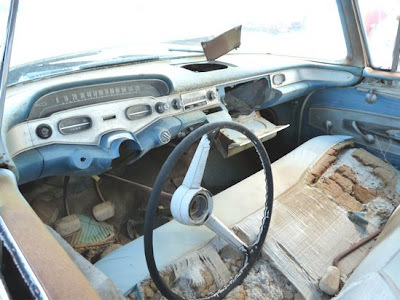 The interior doesn't look too hot, someone needed some parts and took them. The old speedometer still looks cool, though. Now we're going to back further in time, to this Austin-Western pull-type grader No. 11, vintage unknown, but we're guessing 1920s or 1930s. 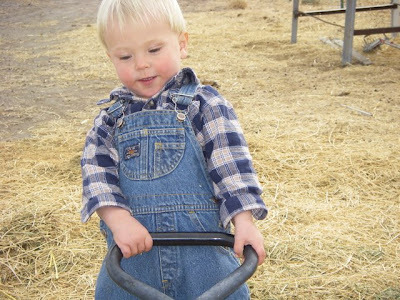 This road grader was pulled by horses or a tractor, and the wheels that Desert Boy is having fun spinning controlled the height of the blade. Here's a view of the grader from a bit further away, so you can see the iron wheels and long arched frame. The operator had no seat--he had to stand. Next to it is another old Austin-Western pull-type grader, a No. 31. This one is a bit newer, with a hydraulic system to control the blade. But the operator still had to stand. 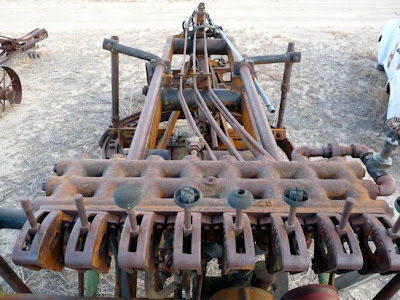 This is a dump rake used for raking hay into piles. 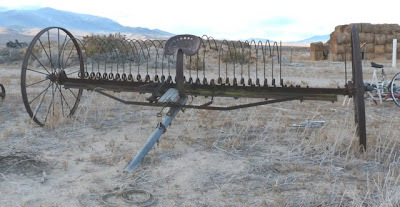 Before the dump rake went out in the field, a sickle bar was used to cut the hay. 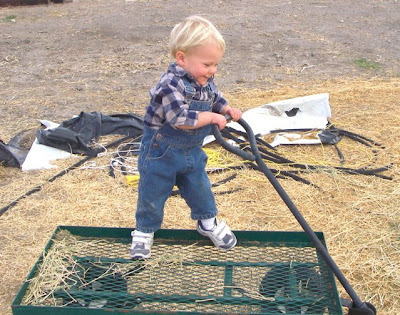 Then the hay dried, and the dump rake was brought in to gather the hay. 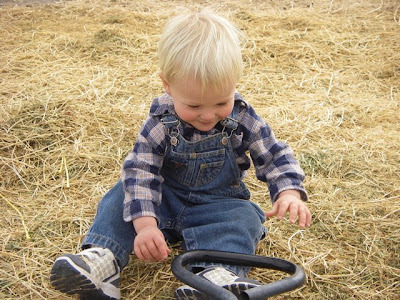 When enough hay had gathered in the rake, , the operator pressed a pedal to let the hay fall in a pile. Then the horses (and later tractors) continued on until the entire field was raked into piles. 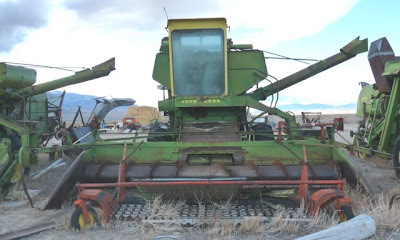 This John Deere 105 combine is from the 1960s. 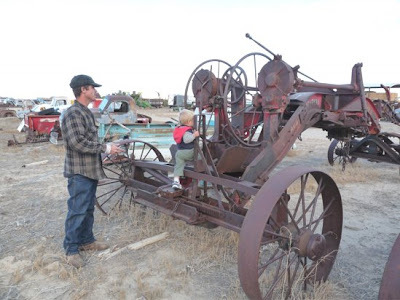 It was used to cut barley, wheat, and alfalfa seed. Once the crop was in the machine, it separated the straw or chaff from the grain. The grain went into a hopper and then out the chute to the side, called an unloading auger. The straw or chaff fell out the back into a windrow and was later baled, or sometimes the chaff was blown into a wagon that followed the combine. 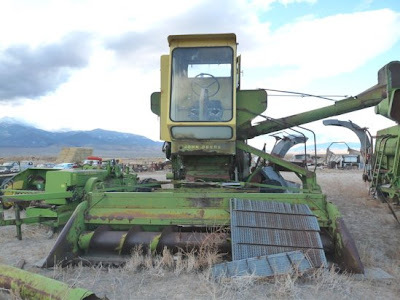 This John Deere 55 combine is smaller and older than the 105, but otherwise it worked pretty much the same way. 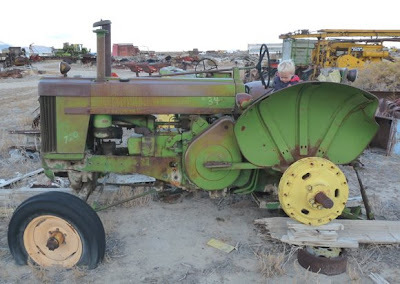 The John Deere 720 tractor from the 1950s looks a little funny because the rear wheel is missing--it was needed for another tractor. See, this really is the equipment yard, full of useful parts! This particular 720 is slightly rare because it has a wide front axle instead of a tricycle. 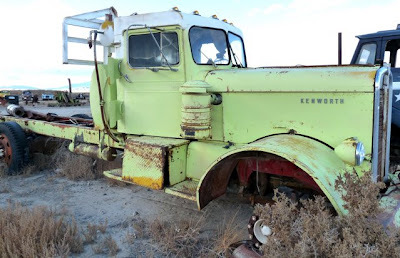 The Kenworth logging truck was called affectionately by my husband and his brothers the chartreuse Kenworth. It was used for hauling water and for a long time it had a cement mixer on the back of it. Its front tire was appropriated for more urgent matters. 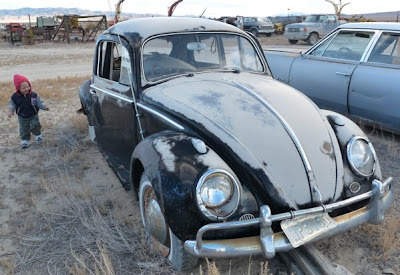 Desert Boy looks kind of interested in this black VW bug, vintage late 1940s or early 1950s. It was a back up car when other vehicles broke down, but eventually it claimed a spot in the equipment yard. 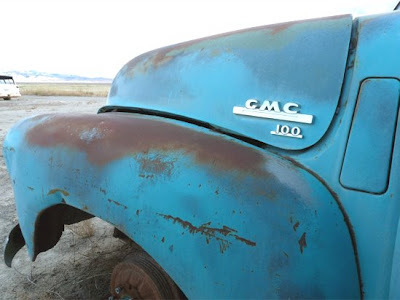 I love the color of this 1953 GMC truck. 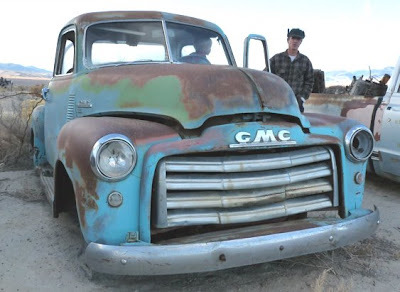 The rust has just added more character, along with the missing headlight. Desert Boy looks ready to take off in it. Ah, I feel so refreshed after a trip to the equipment yard. What treasures will we find next time? Desert Boy has apparently been getting the vibes--it's ball time! What better thing to do on a cold fall afternoon than go out and take a few shots. 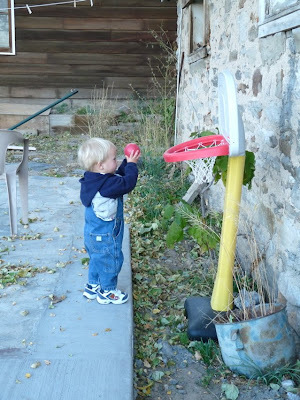 His form looks pretty good as he lines up the ball. 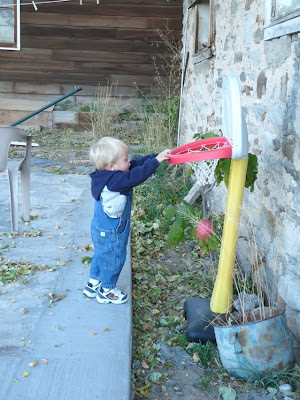 And then, whoosh, he dunks it. Desert Boy 1! 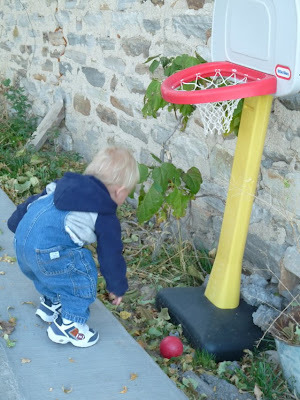 This may look normal, Desert Boy bends to retrieve the ball, but it's not. Usually Henry steals the ball and we have to find another or wait for him to get bored with it before resuming play. No one ever said it was easy to play ball in the desert! 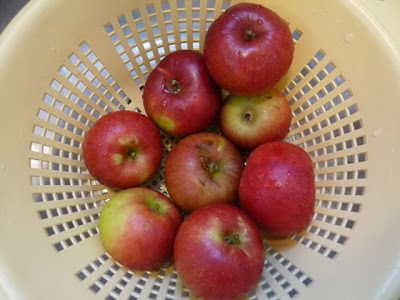 A few days ago we went over to a neighbor's orchard and picked some delicious Winesap apples. I was so happy to get the apples, because we've had several freezes at night and I had thought the apples were ruined, but in fact they turned out to be just fine. 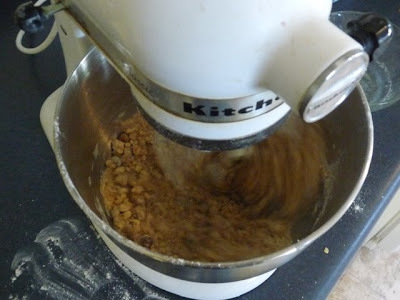 When we got the apples home, my husband dried some apples in the dehydrator and I decided to make an apple crisp. 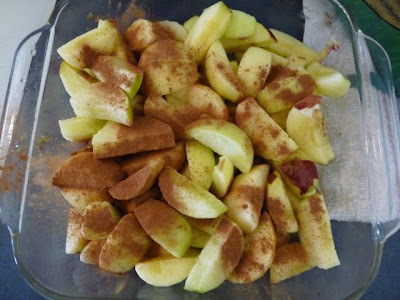 I like apple crisps because they are easy to make and don't take many ingredients: flour, brown sugar, butter, cinnamon, and oatmeal. Except I was out of oatmeal. I searched all my cupboards but couldn't fine any. There was no way I was going to drive an hour each way to town to get some oatmeal, so I decided I had to be creative or do what I dread: make a pie crust. The creativity won out, and I realized I had some granola cereal. It was made with oats, plus had some extra ingredients that had to be good. Then I got out my newest gadget. 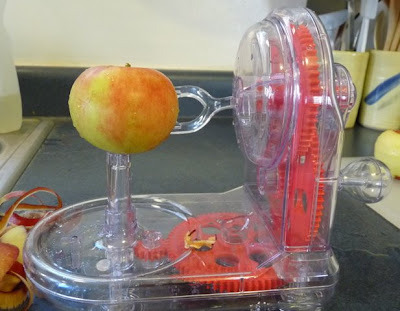 When we picked the apples, the people asked if we had an apple peeler. I told them I had a regular vegetable peeler, and they looked at me like I was crazy. Maybe because I had three boxes of apples and they knew how long it would take to peel them with a vegetable peeler--like until about Christmas. 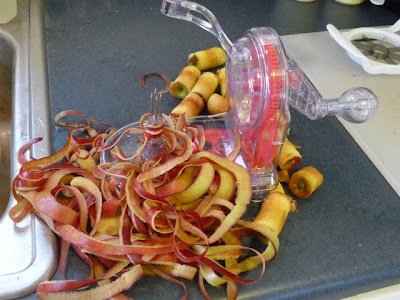 So when I got home I got online and found this cool apple peeler. 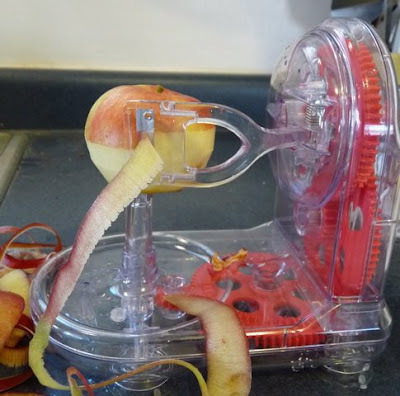 It worked like a charm, and it only took a few seconds to peel the apple. Plus Desert Boy was entertained watching the wheels go round and round. Here are the results of the peeling. I actually peeled 11 apples, but nine made a much more symmetric and pleasing picture. The next shortcut step was to slice them. I have never used one of these before; I know, I must be from the Dark Ages or something. 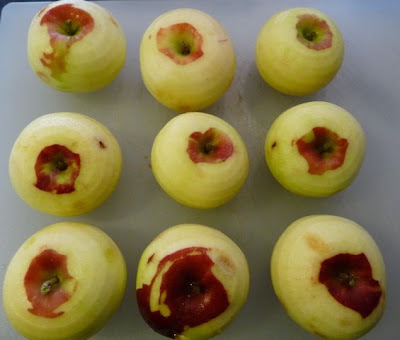 Anyway, I found out how much fun it is to slice an apple in one fell swoop and have it fall apart in eight pieces. I felt a bit artistic as I did it, like I was looking at a flower, with the slices falling open like petals. 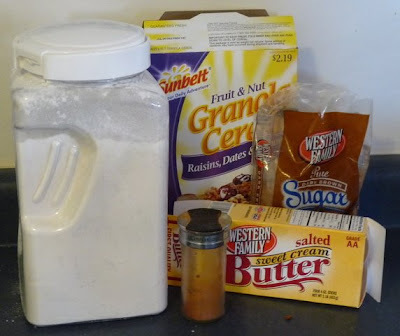 Then I added cinnamon and sugar. The cinnamon came out a little faster than I expected, but fortunately I like it a lot. Then it came time to make the topping. When I'm feeling really with it, I make the topping first, but today wasn't one of those days. Please notice that this is an action shot--the mixer is on--I thought it would make the photo more dramatic. I put the topping on the apples, put it in the oven at 375 degrees, and promptly forgot to set a timer or look at a clock. 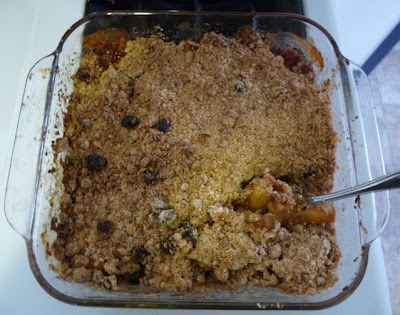 Apple crisp is one of those dishes that fills the house with a wonderful odor, so it really wasn't far from my mind. Except when I went out to rake leaves. It all ended well, though, I rescued the apple crisp in time, and was ready to dish it out when I realized I hadn't taken a photo of the finished product (hence the spoon). It turned out delicious. The granola cereal gives it a little extra flavor. I think that I might put a few raisins on top the next time I use plain oatmeal, they add a nice texture and color to the dessert. Speaking of desserts, I have a separate blog called Dessert Survivor. I don't post on it often, but Dessert Survivor picks up the slack. If you want to see some desserts, head there. In real life, the dessert isn't really done when you take it out of the oven. There's always the cleanup! 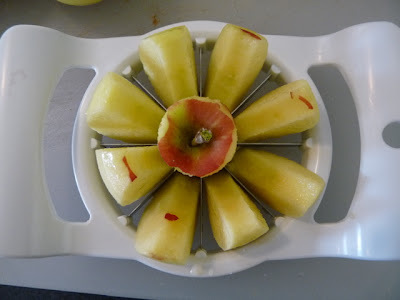 If you want to check out this cool apple peeler, click on the photo.